In prior decades, many used car dealers used the phrase “as is” to justify the sale of defective or damaged vehicles to consumers, who when they later discovered their car’s issues, could not pursue a claim against the dealer who stated that the buyer had been forewarned that they may be buying a car with issues. Fortunately, a few years ago, the FTC stepped in and implemented a series of regulations regarding the use of “as is” on vehicle price stickers. This means that some buyers may still have claims against the used car dealer who sold them their vehicle, even if they purchased the vehicle “as is.” For help filing your own claim against a dealer who used fraudulent means to sell you a vehicle, please contact a member of our used car fraud legal team for advice. The buyer will bear the entire cost of repairing any defects in the vehicle that currently exist or that could occur in the future. Dealerships are also required to notify potential buyers when a vehicle was previously totaled and can be held liable for damages when they fail to fulfill this duty. In addition to the sticker in a vehicle’s window and a statement on the sales agreement, used car dealers are required to comply with the FTC’s Used Car Rule. This rule states that dealers must also display a Buyers Guide in all of their used cars and to provide a copy to the buyer upon concluding the sale. This applies equally to light-duty trucks and vans, standard passenger vehicles, new cars that have never been owned, used as rentals, or leased, but have been driven by employees of the dealer, which are known as demonstrators, and program vehicles, which are current model year cars, with low mileages that have been returned after short-term rentals or leases. 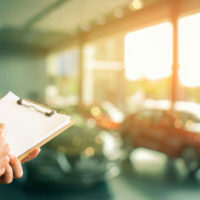 Buyers Guides must come with a variety of information, including whether the vehicle is being sold “as is” or whether it comes with a warranty. For help with your own used car fraud claim, please contact dedicated attorney Louis S. Schwartz at CONSUMERLAWPA.com today. Our Pennsylvania legal team is eager to assist you with your case.